Another thing I’m trying out. Weekly recipe tests! I’m not such an accomplished cook that I can make up my own recipes quite yet. (Though I think I’m getting there.) But I do try new recipes all the time so I thought it’d be worth sharing them here. 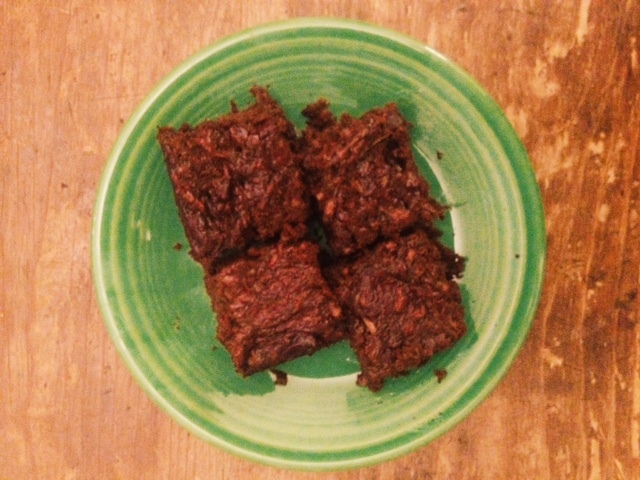 This week’s test: these Zucchini-Almond Butter-Dark Chocolate Brownies. They’re really good! And they were super easy to make. After we saw The World’s End yesterday, a bunch of my friends came over to hang out until Breaking Bad. Vincent and I went to the grocery store and bought a bunch of appetizers (Bagel Bites, sweet potato fries, cheese and crackers) as well as the necessary ingredients for these brownies. Believe it or not, I don’t keep almond butter or dark chocolate chips in my cupboard. While some of our apps were cooking in the oven, Vincent and I mixed up the brownies. Well, Vincent did most of the mixing and I did the zucchini shredding/grating. Pretty much you just throw all of the ingredients in a bowl (leave out the zucchini and the chocolate chips), mix them up, and then fold in the zucchini and the chocolate chips. The product tastes a lot like a chocolatey, gooey zucchini bread than a traditional brownie but I promise it’s just as delicious. 1. Preheat the oven to 350°. Line a 9×9” brownie pan with parchment paper and lightly spray the paper with olive oil. 3. Mix together everything else! Fold in the zucchini pieces and dark chocolate chips, mixing just until combined, and pour it all into your prepared pan. ← Reading Week: Psycho Killer, Qu’est-ce que c’est?